Petali Islands are one of those places one must see once in a lifetime! Famously known as one of the treasures of Greece and the Aegean sea, it's a must visit kitesurfing destination. Petali Islands gather a whole bunch of gorgeous islands, offering private spots and crystal blue waters. There are three boats to choose from depending on your preference. The boat is booked as a whole boat. Spend the next 5 days in the multisport paradise of Petali Islands, sailing to numerous islands in the area, kitesurfing, stand up paddleboarding, snorkeling and relaxing. During the week, if you prefer you can enjoy local food of Evia Island and party at the local bars. Intermediate and advanced. If the clients wish, lessons can be included at an additional cost. Petali Islands, an amazing hidden paradise, are located one short hour trip from Athens offering guaranteed wind conditions, flat water areas for paddle boarding downwind trips and numerous diving sites. Absolute privacy is offered at the place that famous painter Pablo Picasso, the ex-kings of Greece and some of the most famous Greek ship owners built their holiday houses in the early 60’s. Food is not included in the package price. Guests would have to buy their own or choose a hostess to cook for them. Please book your flight to arrive at Eleftherios Venizelos International Airport (ATH). From there, you need to go to Rafina Port, which is located 15 minutes drive from the airport. 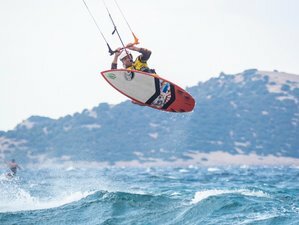 Since 2006 KiteGreece is known across Europe for being a leader in kiteboarding lessons and teaching. Situated on Evia Island in Lefkandi and Marmari. Get a special discount of 10% for Exclusive and Exclusive Plus Kite Cruise packages for May and September.